For the second year, the GBL has sponsored local high school individuals to volunteer abroad as representatives from our community. This summer the GBL provided matching funds for; Lindsey Fox (NEHS), Maggie Murray (FHS), and Trina Paul (PHS) to participate on a Cross Cultural Solutions (crossculturalsolutions.org) high school volunteer abroad program in Costa Rica. The girls volunteered at a health care facility for abandoned elderly. During their free time, they visited local historic sites, churches, markets, attended a soccer game and climbed atop the dormant Volcano Irazu. Although the girls were worried about the language barrier, they quickly learned it didn’t matter; as just a gentle hug, or a smile from a resident allowed them to experience the true meaning of being a volunteer. My favorite moments in Costa Rica were when I was helping a chef prepare meals. She spoke no English, so it was a challenge to communicate, but we overcame the language barrier and become very close during our week together. 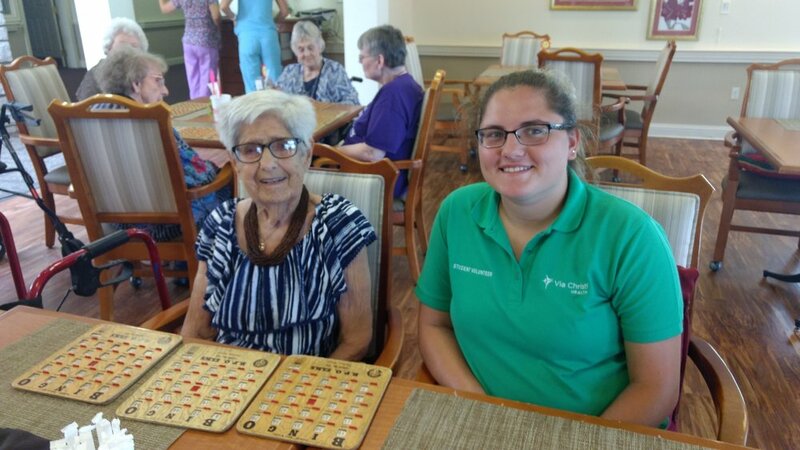 I also really enjoyed working in the nursing home where I had a variety of jobs from feeding the residents to folding laundry. One moment that I will never forget was when I was folding towels with some local teenagers, and the song “Macarena” came on and we all danced. It is still hard to believe that I had the opportunity to volunteer in Costa Rica. I am so grateful for the generosity of the Get Busy Livin’ Foundation and the Community Foundation of Southeast Kansas. Everything about the trip was a great memory and something I think about every day. “Our finger prints don’t fade from the lives we touch.” How amazing it was to be part of something so life changing. The best moments of the trip were the simple ones. Holding the residents hands and having conversations despite not even speaking the same language. Additionally, meeting and making friends with other high school volunteers who shared the desire to help others will always be remembered. The GBL is very proud to promote volunteerism abroad and only hopes to expand this program to get Southeast Kansas youth out into the world. “We must always learn from experiences, for through experiences we learn about our self and grow” (DQM). At the beginning of the 2017 fall semester the Get Busy Livin’ Club was formed at PHS. Approximately 53 students from all levels (Freshman – Senior) and social/diversity groups have begun to set a very strong agenda to serve others; as well as their selves. After only a few gatherings they are scheduled to work delivering food for the Wesley House, volunteering for clean up duties at the YMCA, designing GBL Club tee shirts; and helping organize for the Spring GBL 5K run event scheduled for early May 2018. The club’s purpose as a service organization is to exemplify the values of GBL, to live life to the fullest, provide service to others in the Pittsburg community; and inspire and build character in its members. We cannot begin to describe how grateful we are to the sponsors and students at PHS for carrying forth our mission. Go Purple Dragons! For the second year the GBL has provided matching fund grants to local organizations to complete worthwhile causes. The following youth volunteerism activities were completed this year. Stuff the Bus occurred in Labette County; where the community youth collected and distributed school supplies to families in need of a little assistance. Mission Trip to West Virginia was a great success for 37 students and 14 adult supervisors from St. Mary’s Colgan that traveled to the Appalachian Mountains to help renovate and repair homes. What a great experience for these young people. Growing Growers was a new program that GBL helped sponsor this year. The KSU Wildcat Extension District in cooperation with C-Tech constructed a new greenhouse garden area on its Pittsburg campus location. Its goal is to become a “hands on” lab for community members to encourage and learn about the production of locally grown foods and vegetables. Project Patient Satisfaction was sponsored thru Via Christi/Mount Carmel Foundation. Several high school and college volunteers donated their time to assist patients that were undergoing difficult medical conditions.